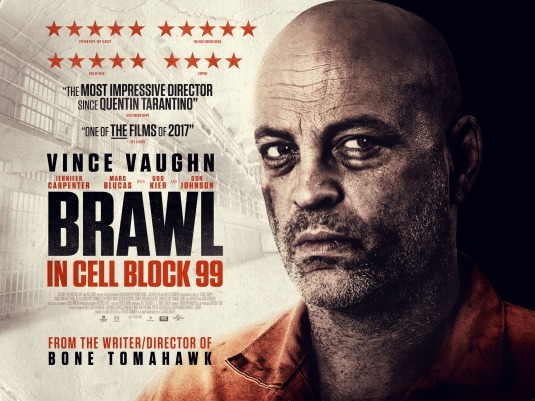 Home » Blogs » Quick Review: ‘Brawl in Cell Block 99’ is the overlooked film of 2017. Every year I try to look for films that I consider hidden gems. These are films that for whatever reason were a hell of a lot better than the box office would indicate. Maybe it was because the release date sucked, and it was overlooked by bigger Hollywood blockbusters. Maybe the studio that produced it thought they had a clunker so they invested little in promoting it. Either way, Brawl in Cell Block 99, is one of those films that deserves a second look. Brad Thomas (Vince Vaughn) is a man who returns to his previous career as a drug mule after being laid-off at an auto repair shop. Several months later, things seem to be going well financially for him and his pregnant wife. However, we all know this type of lifestyle eventually comes crashing down. A deal goes bad. He ends up in prison where he is given an ultimatum behind bars in order to save his pregnant wife and unborn child. The plot in this film is nothing out of the ordinary. Vince Vaughn is what makes this movie work! The often comic actor seems to portray this intimidating & brutal character so effortlessly. Brad has a strange moral compass. While his violent actions seem cold to the people he hurts, they are clearly motivated to the viewer. I found myself wondering where the hell this version of Vince Vaughn has been for most of his career. He had unsuccessfully played a villain in Domestic Disturbance (2001) & Psycho (1998) but let’s forget those. It wasn’t until HBO’s True Detective (2014) that he finally figured it out. I will warn you, The violence only intensifies as this film progresses. If that bothers you, you should skip this film completely. Otherwise, I encourage you to check it out. It certainly isn’t Oscar worthy, but it isn’t a waste of time. – If you have a problem with some gritty violence stand clear.